Request for Proposal: The Hard Questions Worth Asking. Putting together a request for proposal can help your business get the most value when buying a social media management platform. If you’re an experienced social media marketer, you already understand the complexities of managing multiple social accounts – which is why you are actively looking for a social media management platform. But just as every social media platform has its own intricacies and frameworks, so do the many available management tools. To ensure you purchase the toolkit you actually need, your team needs to draw up a comprehensive list of requirements that it must meet. And to save yourself and your team from evaluating completely inappropriate management tools, this feature list can be used to create a request for proposal. The request for proposal (RFP) can be circulated to prospective vendors, placing the burden on them to prove their product can meet your social media challenges. The written RFP will help you further narrow your shortlist and ensure that your project goals and target audience are clearly defined before you begin your social campaigns. Investing time and effort into your RFP will pay off in the future, not least because it becomes an objective benchmark against which all of the products can be compared. So what does an effective RFP include? You have a lot of questions, and you need exact answers for each. Your RFP must ask precise questions to ensure that suppliers provide the detail you need to make an informed decision. Vague questions result in vague answers, so make sure you ask specifically what you want to know. This requires more effort on your part, but it’s preferable to weeding through vague answers or doing a lot of back-and-forth clarification with the prospective vendor. For maximum efficiency, don’t be afraid to use Yes/No checkboxes. This approach reduces ambiguity and saves time for you and the supplier when completing and reviewing the RFP. A picture is worth a thousand words, so don’t be afraid to ask suppliers to provide diagrams and screenshots. These images will help you get a feel for how easy a system is to use without spending time getting a full demo. At the request for proposal stage, the focus is on narrowing the field of candidates – you can carry out full tests once you have a shortlist. A platform screenshot like this one can give you a glimpse of how the software is set up and what features are included. Definitely worth 1000 words (or more!). To avoid missing important details in your request for proposal, make sure that questions are grouped by topic or theme. Create sections to cover the activities you need to carry out – listening, publishing, reporting, etc – to make the document easier to complete. You will also find the resulting report is much easier to understand when it comes time to compare the responses received. There’s a very real possibility that none of the available platforms will perfectly meet your needs. So you need to prioritize your requirements according to your social media strategy. Don’t be afraid to tell vendors what is mandatory, and what counts as ‘nice to have’ so that they can quickly exempt themselves from your considerations if they can’t meet those needs. Most likely, you need a social media management tool sooner, rather than later. So, you should tell vendors what you expect them to deliver in their RFP, as well as a firm deadline for their submission. Otherwise, the consideration process could drag on indefinitely. Also, the timeliness of a company’s response to your RFP is a good indicator of how they’ll behave in a business relationship. So, consider delivering the proposal on time as the criteria for your first elimination round. As valuable as RFPs are, there are a few factors you need to consider. You will almost certainly end up with a pile of documents that need to be thoroughly read, and compared manually against each other – a time-consuming process. And if your request for proposal is poorly-worded, it can take even longer to process each submission, as you’ll be cutting through “fluff” to try and understand what the vendor is trying to tell you. Additionally, if there are no pictures to refer to, you will need to try and visualize each tool using only the written descriptions. To help make this process easier, we assembled a guide for you to download, which you can find at the end of the article. Once you’ve narrowed down your potential vendors, seeing the social media tool in action is the best way to get a proper overview of capabilities, features, and ease of use. Before you decide, schedule a live demo with a real person who can show you the software and answer any final questions you might have. A live demo is the best way to get this overview and provides the opportunity to ask questions about your social strategy, and exactly how to use the platform to meet your goals. These sessions also give you a chance to get to know the vendor, build the relationship, and determine if and how you can work together properly. Creating an effective RFP can be complicated and time-consuming – which is why we’ve put together a short guide that will help you get started quickly. 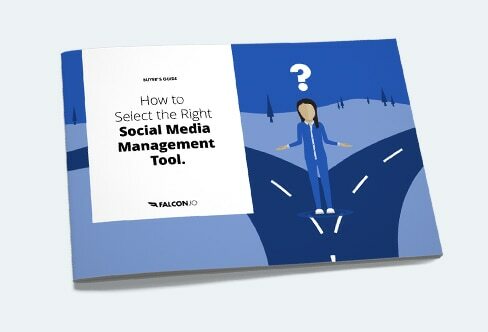 Grab your free copy now and avoid the risk of choosing the wrong social tool for your needs. We look forward to (hopefully!) receiving your RFP, too. Download our free guide for a step-by-step process to creating an effective RFP.